This is a card game used to practice the superlative, and possibly the comparative. Students match a person with an adjective and say " is the est." deck of adjective cards (three available: one with regular adjs in their basic form, one with the adjectives written in the superlative, and one with irregulars). This activity is based on the party game "Apples to Apples." For further information please see http://en.wikipedia.org/wiki/Apples_to_Apples . 2. Give each group a deck of adj cards and a deck of people cards. 3. Each student draws 5 cards from the people deck. 3. Designate one student as "the judge." 4. The judge draws one card from the adj deck and reads it aloud. 5. Each student other than the judge chooses one people card from their hand and places it on the table saying " is the est. 6. After all students have placed a card on the table, the judge chooses the card he things matches the adjective the best and says " is the est." 7. The judge gives the adj card to the student who put down the best card. This is one point. 8. The used cards are put in a discard pile, and each student draws a new person card from the person deck. 9. The student sitting next to the old judge becomes the new one, and the old judge becomes a normal player. 10. Repeat from step 4. When finished, the student with the most adjectives wins. For advanced classes the content can be made more complex. The judge may be required to say "person A is taller than person B, person C, and person D, so he is the tallest." The people deck should be changed to contain the names of the ALT and the English teacher. 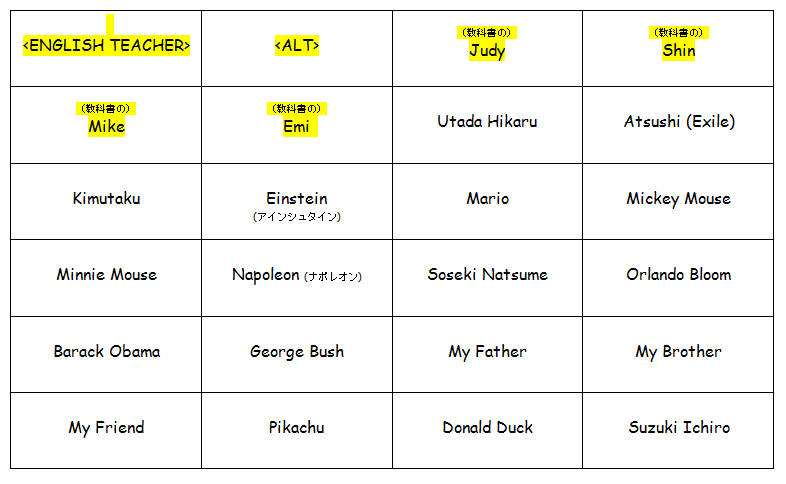 The names of the textbook characters are also included. Please change these to match your class and textbook. To keep decks from getting mixed up, print the people deck on differently colored paper from the adjective deck. Students will be tempted to use only Japanese. You will need to police them. Some kind of punishment (taking all of their cards) should be devised for not using English. Students may not know all the celebrities, or all the Adjs. It might be wise to go over the contents of the decks with the students before playing. "stupid" and "ugly" are included in the adjective deck. If your students are prone to bullying each other, you may wish to remove these.